Seasons greetings from the EAA President, an introduction to Ljubljana and a reminder of the Call for Papers. The ICORIA 2015 London was a great success. Thank you to everyone who attended the conference, and the Chair, Professor George Christodoulides at the Birkbeck University of London and his organizing team. The ICORIA 2016 will be held in the European Green Capital 2016, Ljubljana, Slovenia, during June 30 - July 2, 2016. 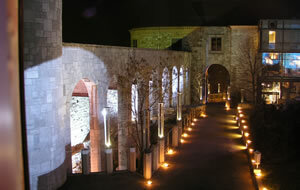 The conference will be chaired by Professor Vesna Žabkar at the University of Ljubljana. We look forward to seeing all of you again there. During 2015, we made some important progress. First, we created the EAA Flemming Hansen Award for excellence in advertising research. Professor John Rossiter was the first recipient of this award in London. He deserves our respect, our admiration, and our deepest gratitude for his unquestionable contribution to our scientific knowledge. Second, our trial joint membership with the American Academy of Advertising (AAA) has been very successful. We now have more than 70 joint members who enjoy all the benefits of both organizations. The joint membership registration is available at the AAA homepage. Third, our Board members have been working hard to improve our organization. Hilde Voorveld effectively manages our Web site and Newsletter. Our ICORIA peer review is in good hands with Sophie Boerman. 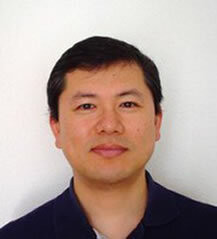 Martin Eisend now edits Advances in Advertising Research VI, while guest-editing a special issue of the International Journal of Advertising based on the best papers from the ICORIA 2015. We owe Sandra Diehl for our efficient financial management. Tobias Langner is responsible for the selection process of our awards, and Sara Rosengren continues her effect to assemble our next edition of Ph.D. Colloquium. Finally, my EAA presidency will end after the ICORIA 2016, and Patrick de Pelsmacker will take over the position. Unfortunately, Robert Heath has decided to step down from our Board. Robert was one of the founding members who devoted considerable time, effort and resources to the development of the EAA. We want to thank Robert for your long-standing commitment to our organization. We’re looking forward to 2016 for our further growth. We wish you a Merry Christmas and a Happy New Year! The 15th International Conference on Research in Advertising (ICORIA) 2016 will be held in the European Green Capital 2016 – Ljubljana, Slovenia. The visitor’s first impression of Ljubljana is that it is an exceptionally young city because its more than 50,000 students lend it a special youthful feeling. Many scientists come to Ljubljana because of its university and institutes with solid international reputations. 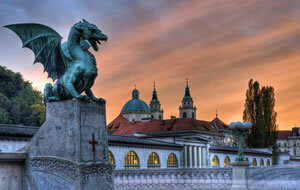 Ljubljana has some 276,000 inhabitants and is considered a city that suits both its residents and many visitors. Even though it is a middle-sized European city, it maintains the friendliness of a small town and simultaneously possesses the characteristics of a metropolis. Here, at the meeting point of the cultures of east and west the old comes together in harmony with the new. In Ljubljana, remainders of all five millenniums of its history are preserved, including the legacy of the Roman town of Emona and the Old Town with its medieval castle, and Renaissance and Baroque facades with ornamental portals and uneven roofs. The mosaic is complemented with the bridges over the Ljubljanica River and the vast Tivoli Park which extends into the very centre of the city. Ljubljana’s present image mainly generated by the Italian Baroque and partly by the Secession period of 200 years ago is reflected in the style of the many buildings erected immediately after the earthquake of 1895. In the first half of the 20th century, the world famous architect Jože Plečnik left his distinctive personal stamp on his native city while also taking European standards into consideration. The city's image was later shaped by his more liberal disciples and the Art Nouveau creations of other renowned young Slovenian architects. Ljubljana is a city of culture. It is home to numerous theatres, museums and galleries and boasts one of the oldest philharmonic orchestras in the world. For the people of Ljubljana, culture is a way of living and thinking and is very much part of their everyday life. The first music society in Slovenia, the Academia philharmonicorum labacensis, was founded in 1701. Its honorary members have included renowned composers such as Joseph Haydn, Ludwig van Beethoven and Johannes Brahms, and distinguished musicians like the violinist Paganini. Between 1881 and 1882, at the very start of his career, Gustav Mahler was the resident conductor. Over 10,000 cultural events take place in the city every year, including 10 international festivals. These events allow both the inhabitants of Ljubljana and visitors to enjoy artists from different fields of music, theatre and fine arts through to the alternative and avant-garde. Read more about Ljubljana here and there. The ICORIA is the annual conference of the European Advertising Academy (EAA) whose objective is to promote, disseminate, and stimulate high quality research in advertising. The ICORIA offers excellent opportunities for advertising scholars to build a knowledge exchange network and develop collaborative relationships in research. Advances in Advertising Research are published by the European Advertising Academy (EAA). This volume is a compilation of research presented at the 13th International Conference in Advertising (ICORIA), which was held in Amsterdam (The Netherlands) in June 2014. The conference gathered around 150 participants from diverse countries from Europe, North-America, Asia, and Australia. This book provides insights into the inspiring and multifaceted field of advertising research, which is confronted with challenges regarding ad content and execution, media placement, as well as online and social media. Distinguishing between digital, classic, subtle, and alternative advertising formats, renowned scholars from around the globe contribute state-of-the-art research on these issues in 30 chapters. All authors will receive their copy in the coming weeks. 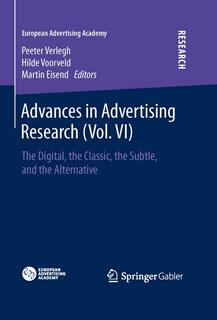 The book series “Advances in Advertising Research” is published by Springer Gabler and can be ordered on springer.com.